Sayuri Chetty’s tale of the world bottle. Can a stackable beer bottle help to make construction more sustainable? As the story goes, beer magnate Freddy Heineken came up with the idea of the World Bottle when he saw waste materials being recycled to build dwellings in the slums of the Caribbean. 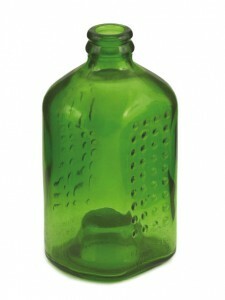 At his request, John Habraken designed the first stackable bottle in 1962. The ribbed glass and the depression in the bottom of each bottle reinforce the construction of the brickwork. The bottle remains a prototype. The brewery’s marketing department is afraid the idea will harm their image. As an experiment, Habraken builds a house made out of bottles for Heineken. In 1975, the beer bottle once more surfaces as a possible building material, although critics say that far from solving the issue of recycling leftover bottles, the World Bottle would only encourage people to drink. To get the number of bottles needed to build their house, people would have to consume a substantial amount of beer first! I found this idea really really avant-gardist and full of possibilities. I think it is a field that designers should investigate more. Not recycling materials, because it is only a reaction on the consequence of the harmfulness we have dealing with the wastes of our mass consumption society, but design the product without forget that someday it will become a waste that will take a lot of place and long process before this object will be transformed and recycled (PET recycling process for instance). What would be a world where all consumption object would be designed like this: one function before/another function after it would become a waste?